After his own little fiasco involving the recent toll increase fiasco (Toll hike for SPRINT not referred to Board, says Subang MP, The Rakyat Post, Oct 15) it's understandable if YB Sivarasa Rasiah must go looking for an issue that can help him regain some political points. The Sungei Way Deepavali bazaar petty traders' issue looks ideal for such: it is a super sensitive issue that has angered the Indian-Hindu community even more after YB Tony Pua got involved in a ruckus there the other day, which may or may not have started after the DAP man accused some present company for budaya samseng (PKR men lodge police report against DAP's Pua, FMT, Oct 16). 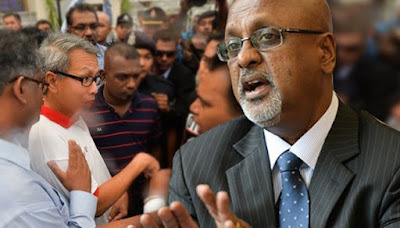 "Having watched the videos of the incident (in particular the Kinibiz video ) and read the Malaysiakini accounts dated 15.10.2015 and talked to some of those present, it seems to me quite clear that the heckling started after the crowd present which included traders understood that Tony had just said to the media present that ... the move to Easwary Temples area was necessary to stop certain persons from committing extortion of the traders in the original site." What I find amusing is that while Sivarasa clearly thinks the DAP man messed up with the Deepavali petty traders' issue, he seems to want us to believe that his friend Tony is better poised to deal with bigger national issues like the 1MDB and removing the PM and ending UMNO's "corrupt, oppressive and inefficient" rule. Wow. To quote my prolific friend Johan's prolific son, "I cannot brain." "My friend YB Pua has done sterling work ( and continues to do ) on critical national issues such as IMDB. He should concentrate on those issues and leave more mundane issues, like as in this case, about where a Deepavali bazaar should be located, to the appropriate authorities to decide. "We have far bigger battles to fight. We need to remove Prime Minister Najib and end the corrupt oppressive and inefficient rule of UNMO and BN. Let us remain united and focused on that." So, walk away, Tony, take on someone your size. Is that it? From certain angles, tony pua looks like an Ah Soh, auntie auntie type with a very bitter, bitchy interior. Can you guys see it too? Just imagine him holding one of those Wan Azizah cina handheld fans. I can totally see it! Like a bitchy scheming consort in the harem of Emperor Apek Kit Siang. "In the case of 1MDB, all the dots connecting money laundering and corruption allegations are pointing to two persons – Jho Low and Najib’s stepson Riza Aziz. FBI just needs to investigate the source of income that had enabled Jho Low to purchase a US$23.98 million apartment in the Park Laurel condominiums in Manhattan." "Just like Leonardo diCaprio in the film “Wolf of Wall Street”, Jho Low’s high profile partying with Paris Hilton doesn’t help the situation. Besides the US$23.98 million Park Laurel apartment, Jho Low (real name Low Taek Jho) also bought a mansion in Beverly Hills for US$17.5 million. Both real estates, amazingly, were then sold to Riza Aziz." Mohamed Badawy Al-Husseiny is the same guy who connects Falcon Bank Singapore, the JV with 1MDB in 2013, and $100 million "PERSONAL financing" (from his own pocket) for that Wolf movie. How can a mid-ranking petroleum executive pull US$100 million from his pocket to fund a movie personally? Cannot brain how BR1M and tolls are linked. If the GST is going to bring in RM7 billion this year, as estimated by the Customs Department, why link the government’s ability to pay BR1M or otherwise with the increase in toll rates? asked Shahbudin Husin, the analyst. The analyst reckons that Najib’s weird behaviour of late, and getting increasingly weird all the time, may be due to him being distracted by the RM2.6 billion political donation controversy and/or the fact that he’s the only Prime Minister in the world who had such a large “political donation” in his personal accounts. Memang yak ada yang komen sebab pembaca blog ni adalah penyokong BN tetapi tak suka Najib yang songlap duit rakyat. Tak Salah pon kalalu nak accused dsto as najib lapdog or paid blogger seban dah jelas pom. Tengok ada tak kenyataan majlis raja raja diberi perhatian olih blog ni.